For example, at the end of August 2018, the Danish Maersk Company, one of the major ship owners in the world and the “world’s largest container shipping company by both fleet size and cargo capacity” (website), sent a first container ship using this route, in order to test its commercial use. The ship went from Vladivostok to Saint Petersburg, through the Bering Strait, following the northern coast of Siberia (Tom Embury-Morris, “Container Ship Crosses Arctic Route for First Time in History Due to Melting Sea Ice”, The Independent, 18 September, 2018). Since 2013, each year, the number the number of Chinese cargo convoys using the Russian Northern Sea Route, also known as the North East passage, increases thanks to the rapid warming of the region, which transforms it into a navigable space. In the meantime, the Russian political, economic and military authorities have launched a massive program of infrastructure, maritime and defence development of this 4500 km long area, linking the Bering Strait to the Russian-Norway frontier. Meanwhile, Russian, Chinese and French energy companies have been developing numerous and massive oil and gas operations in the warming Russian maritime exclusive economic zone (Jean-Michel Valantin, “The Warming Russian Arctic: Where Russian and Asian Strategies Interests Converge?”, The Red (Team) Analysis Society, November 23, 2016). This impressive Russian effort is even more important to understand that Russia is a global energy giant, and works at keeping this status. Currently, Russia possesses vast reserves of oil and gas, with more than 80 billions barrels of proven reserves and 44,6 trillion cubic metres of natural gas reserves, superior to those of Iran (US Energy Information Agency, “Russia”, July 28, 2015). In September 2018, the Russian military organised giant manoeuvres in Siberia and in the Russian Far East. The Chinese military was associated to this “Vostok 18” exercise. Then, from 23 October 2018 to 7 November 2018, NATO organised the “Trident Juncture 2018” manoeuvres in the Arctic region, between Norway and Iceland, thus leading its largest military exercise since the end of the Cold war in 1991 (Christopher Woody, “The US Navy is pushing north, closer to Russia in freezing conditions — and it’s planning on hanging around up there“, Business Insider, 7 November 2018). These occurrences beg the question to know if they are linked by “more” than the opportunities emerging from the warming of the Arctic due to climate change. One wonders if they are not also manifestations of a deep reorganisation of globalization that would be driven by the pressure exerted by new geo-economic national interests, which meet and collide in the warming Arctic. In order to answer that question, we shall look first at the strategic meaning of the current militarization of certain areas of he Arctic. Then, we shall see how the warming Russian Arctic attracts different Asian national interests and thus becomes a new geo-economic space linking Asia to Russia and the North Atlantic zone. Then, we shall see how the crossover of geo-economic and military national interests might signal the emergence of “neo-mercantilism”. From 25 October to 7 November 2018, the North Atlantic Treaty Organization (NATO) organised for the first time mammoth manoeuvres in the Arctic region, named Trident Juncture. These manoeuvres mobilised 50.000 soldiers, 150 planes, 10.000 land vehicles and 60 warships. They were centred on Norway and Iceland, where landing, deployment and combat exercises took place. They were led to demonstrate the reaction capability against a hypothetical and unnamed adversary that would endanger a fellow NATO member in the Arctic region. This official “anonymousness” did not stop Russia to protest officially against this military exercise taking place very close to its land and maritime frontiers (Christopher Woody, “Russia aims its missile drills shoulder-to-shoulder with NATO’s biggest war games in years”, Business Insider, 31 October, 2018). However, it must be noted that, from 11 to 17 September 2018, the Russian military organised massive military manoeuvres of its own named Vostock 18, mobilising 300.000 soldiers, more than 36.000 land vehicles, 80 warships and 1000 planes. For the first time, the Russian political and military authorities had invited the Chinese People’s Liberation Army to participate to this exercise, thus giving a supplementary geopolitical significance to this event by demonstrating the political and military closeness of Russia and China in the face of possible strategic threats (Lyle J. Goodstein, “What Russia’s Vostok-18 Exercise with China Means“, The National Interest, September 5, 2018). Jean-Michel Valantin (PhD Paris) leads the Environment and Geopolitics Department of The Red (Team) Analysis Society. He is specialised in strategic studies and defence sociology with a focus on environmental and artificial intelligence geostrategy. 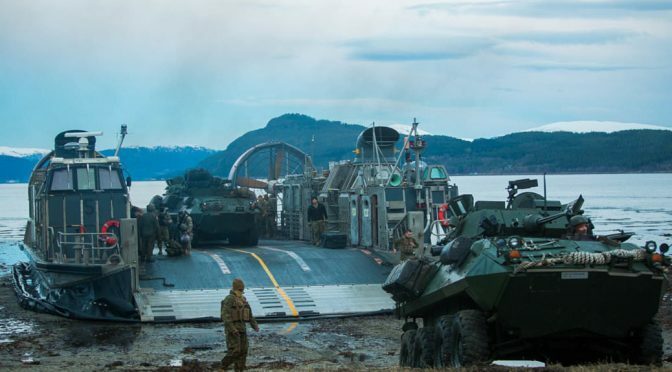 Featured image: U.S. Marines with 24th Marine Expeditionary Unit participating in Exercise Trident Juncture 18 offload an Assault Amphibious Vehicle, carried on a Landing Craft Air Cushion, in Ålvund, Norway, Oct. 30, 2018. Trident Juncture 18 enhances the U.S. and NATO Allies’ and partners’ abilities to work together collectively to conduct military operations under challenging conditions, 30 October 2018, by U.S. Marine Corps photo by Lance Cpl. Menelik Collins, Public Domain.